When viewing electronics, circuit boards, or highly reflective specimens with a stereo microscope, a quality LED ring light is a must. Unitron's LED Ring Light Illuminator for Stereo Microscopes (Model 15854) was created as an economic solution for users seeking to switch from the older fluorescent, fiber-optic, or halogen lights to a more earth-friendly LED light. The Unitron 15854 LED Ring Light was manufactured to fit any stereo microscope with a diameter of 60 mm or less. While the 15854 model fits most currently manufactured stereo microscopes, it may need a special adapter to fit older models. 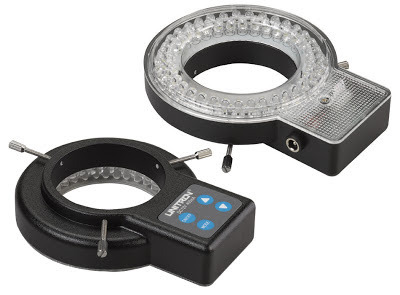 The Unitron 15854 LED Ring Light Illuminator for Stereo Microscopes is available at QSource.com, along with a variety of other quality Unitron Ring Lights. For questions and further information about these products, please contact Q Source at 800-966-6020 or by email. We recently upgraded a number of inspections scopes with these LED lamps and have had several operators complain of receiving shocks when their face touches the scope eyepiece. Our maintenance department measured as much as 45 VAC leakage voltage on the body of the lamp when the power supply is connected to the mains. Has anyone else had similar complaints when using this lamp? Can you send us your contact info so we can further research this issue? Please email us at qweb@qsource.com.